Audit events can be forwarded from Conjur directly into Splunk. Splunk can read the event and parse out every field. This makes searching Conjur logs in Splunk easy and also makes it simple to set up alerts on specific events that happen inside Conjur. For example, an alert can be sent to the security team if a user repeatedly tries to fetch a secret for which they don't have access. 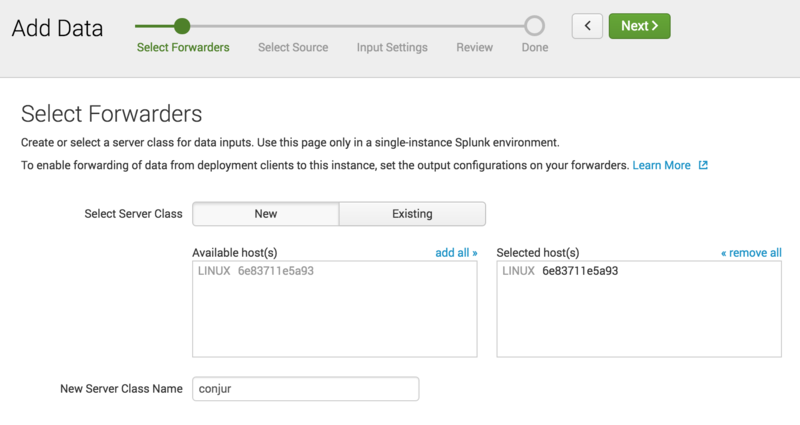 Forwarding Conjur audit logs to Splunk is a powerful way to inspect, detect, and act on Conjur events. Splunk Cloud was used for this guide, but the same steps work for any recent version of Splunk. Audit messages in JSON are written to the file /var/log/conjur/audit.json inside the Conjur appliance. This file has a newline separating each audit event. To make this file available for forwarding, its directory must be mounted to the host running in the Conjur container. After initializing the Docker container, you should see the file /var/log/conjur/audit.json on the host that is running the Conjur appliance. If you are using the Conjur AMI, skip this step. The directory /var/log/conjur is already mounted to the host running the Conjur container. 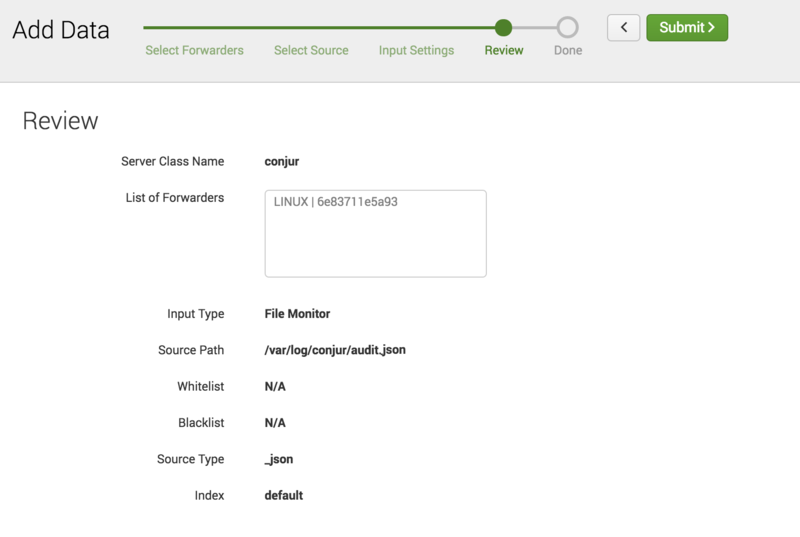 Follow this guide to install and configure a universal forwarder on the Conjur master. Configuration management or a separate linked container can be used to automate this step. Once the forwarder is set up the remaining configuration can be done in the Splunk UI. If the forwarder is configured and running, you will see a host in the list on the following page. Choose this host and add it to a server class ('conjur' is a good class name). On the next screen, select Files and Directories in the sidebar and set Splunk to follow the file /var/log/conjur/audit.json. Since the file is in JSON format, choose _json as the source type on the next screen. Choose the index you want to use. Finally, review settings and submit changes. In a short time you will see Conjur audit events in your Splunk search dashboard.